Recchi Engineering : The construction of new Headquarters for the REALE MUTUA GROUP will be completed in June 2016. The ambitious project for the new Reale Group Headquarters in Turin’s old city centre is now nearing completion. 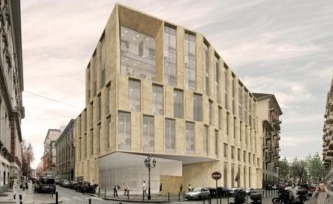 The new headquarters will upgrade an entire city block that overlooks the nineteenth century Piazza Arbarello. RecchiEngineering is working alongside the Reale Mutua Group throughout the entire life cycle of the project, from its architectural design to construction and fitting out of the new operational offices. The project has been conceived and built according to innovative principles in terms of flexibility, building management, environmental sustainability and energy consumption (Zero Emission Building). The new building is expected to receive LEED Platinum status. The project involved the demolition of part of the existing building, of which the original façade has been preserved to maintain a dialogue with the adjacent buildings. The building will house more than 800 Reale Group employees, an underground parking area for 150 vehicles and an auditorium for use by the company and for public events.